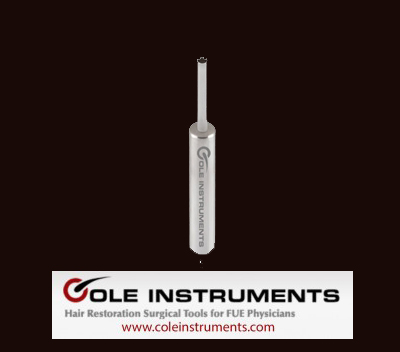 Coleinstruments in Atlanta – USA of Dr. John Peter Cole is proud to announce its offering of advanced and uniquely designed tools and supplies for use in Follicular Unit Extraction or “FUE” hair transplants. The result of extensive research and development by well- known surgeon, John P Cole, these products are tailored for FUE hair transplant procedures. Hair groupings called “follicular units” are subject to damage or transaction (severing) of the hair bulb during removal and transplant. These specially developed instruments can lessen the risk and provide for optimal handling and aesthetic regrowth. Cole instruments offers 4 different punches with these goals in mind. These include 1) Classic CII punch, 2) Serrounded punches, 3) CII Best Value Non Coated punches and 4) CII Best Value Titanium Nitride Coated punches. Choose the best punch depending on whether the procedure is manual or power driven follicular unit extraction to fit both the physician and patient needs. CII punches expedite removal with a much lower transection rate of the follicular units. 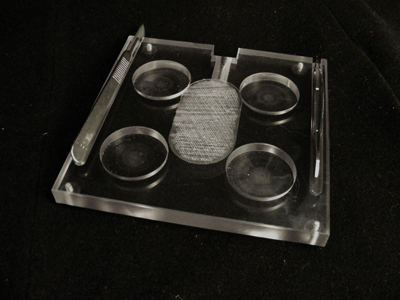 The punches are offered from .85 to 1.30 millimeters in size and facilitate the “Cole Isolation Technique” of minimal depth penetration. The result is a tailored patient approach with greater comfort as well as greater efficiency for the physician. Other state of the art products from CII include the Counting Incision Device that keeps count of the incisions in the area to receive the hair units efficiently and accurately. With advanced features including an LED display, variable blade acceptance and audible count confirmation the device is state of the art. Accurate count is essential and use of the device precludes manual counting errors and promotes accuracy for billing and patient expectation purposes. Cole Instruments also offers specialized Graft Processing Boards, with 4 wells for Processing grafts in FUE and a 2 well board for Slivering in strip harvest procedures. Available back lighting, external lighting or both provides exceptional visibility during the surgical process. 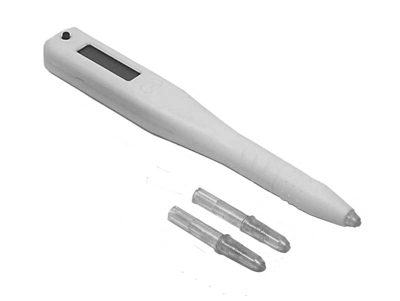 Cole instruments offers also the here on the website already presented PCID automated fue device. The PCID help the doctors and physicians to extract and transplant more grafts per day as with the manual extraction. Also the PCID automated fue machine help the hair surgeon to fight against fatigue. There are several motorized fue machines on the market. But the Graft extraction with the PCID technique offers several advantages in compare to other motorized fue devices and machines available on the market. With the PCID the sharpest Punch in the industry can be used and the transection rate is below 2,58%. Also the PCID offers: precise depth and speed control, limitless setting options including rotation, oscillation and rotation followed by oscillation. Plus: The PCID as a motorized fue hair transplant extraction device – machine developes absolut no heat during the FUE extraction. Also the PCID runs without noise. Are you interested in more informations about the PCID Device or in other Hair Transplant Devices from Cole Instruments? Are you interested in more informations about the fascinating and revolutionizing PCID motorized fue hair transplant extraction device – machine or in other Devices – Machines from Cole Instruments that help you to increase the quality of your hair transplants? Cole Instruments provides selection and state of the art supplies and instruments designed to improve the experience of physicians as well as their patients.